This golden city is filled with a festive air. Acapulco is famed for its daredevil cliff divers who plunge from the 130-foot-high cliffs of La Quebrada. 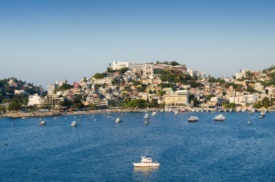 Popular excursions include glass-bottom boat tours, golfing, parasailing and colorful Mexican fiesta shows. Many tourists are content to lounge on one of the city's spectacular beaches.